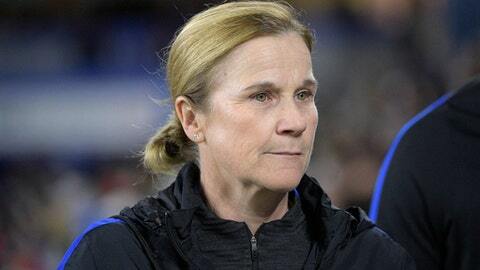 MOSCOW (AP) Female players have an equal right to have FIFA use video review for their tournament next year in France, U.S. women’s coach Jill Ellis said Wednesday. FIFA is using Video Assistant Referees for the men’s World Cup for the first time this year, and it has led to several key call reversals and an increase in penalty kicks. Ellis, who coached the Americans to the 2015 Women’s World Cup title, maintains video review could be even more significant in the women’s game than it is for the men. ”With all the men’s leagues around the world, you’ve got more referees getting more into the higher-level experience. We don’t have that many leagues, so we have to, I think, add another layer to the decision-making process,” she said. Ellis, born in Britain, came to Russia to appear on a Fox studio show and planned to attend England’s semifinal match against Croatia. FIFA has done little-to-no promotion of the Women’s World Cup during the men’s tournament. ”They missed an opportunity to talk about it here,” said Ricardo Font, head of global sponsorships at The Coca-Cola Co., which has been a FIFA sponsor since the 1978 tournament in Argentina. Players on the U.S. women’s team protested the decision by FIFA to play the 2015 Women’s World Cup in Canada on artificial turf, and several of them were part of a lawsuit filed in Canadian Human Rights Court, a case later withdrawn. American players have been outspoken in their criticism of FIFA’s prize structure. The U.S. Soccer Federation received $2 million from a total of $15 million prize money allocated for the 2015 Women’s World Cup, up from the $1 million champion Japan received from a $10 million total in 2011. This year’s men’s World Cup winner will receive $38 million from a $400 million fund, up from the $35 million Germany got from a $358 million total in 2014. The Americans’ 5-2 win over Japan in the 2015 Women’s World Cup final was seen by 26.7 million television viewers, including 25.4 million for English-language coverage on Fox and 1.27 million for Spanish-language coverage on NBC Universal’s Telemundo. Germany’s 1-0 victory over Argentina in the 2014 men’s final was viewed by 26.5 million on TV, including 17.3 million on ABC and 9.2 million on the Spanish-language Univision.